ImagePlant is as easy to use as a website – and proves its efficiency every day. One of our customers uses our multilingual media database software with over 600 backend users, over 30,000 images, over 25,000 documents and more than 15,000 categories. The features, which have been refined over many years of practice, support you noticeably in media management – while comfort functions ensure that daily work with ImagePlant is easy even in large media inventories. Feel free to test all functions of our image database software in our online demonstration. 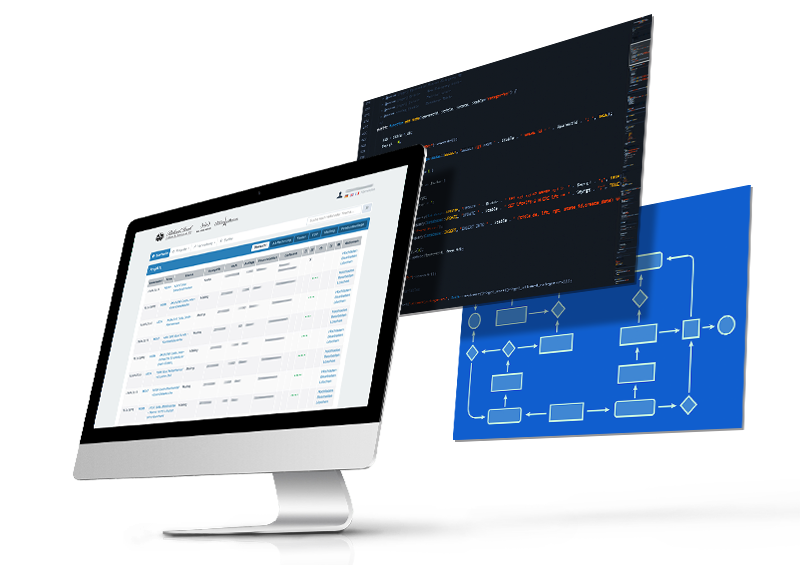 Since we develop ImagePlant ourselves, we can also program individual functions and interfaces to your existing systems (CMS, PIM, LDAP, SAP, etc). We would be happy to advise you on the development of your own media database. Just get in touch. ImagePlant is completely web-based. You do not need any separate software, but can access your image database directly from any location. Everything you need: Internet, a current browser and your login data. 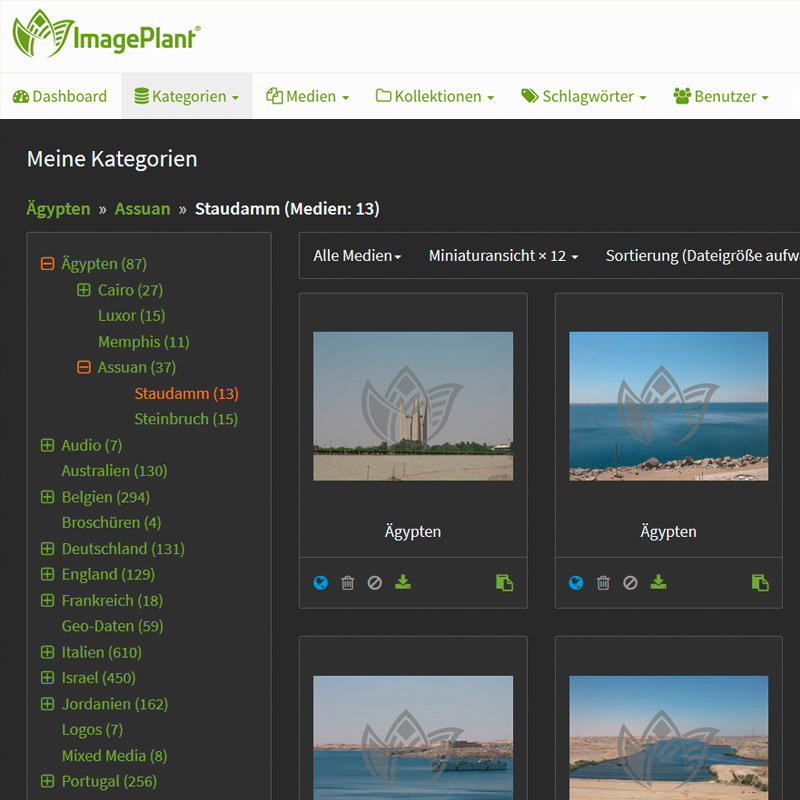 Of course, you can also use ImagePlant within closed networks such as your company's intranet. 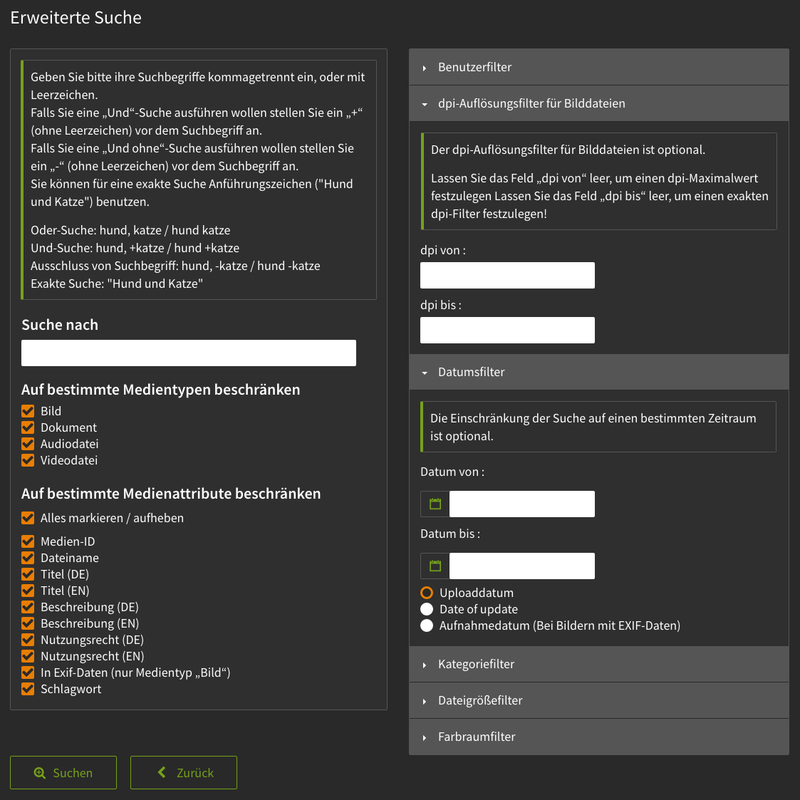 We install our media database software on the server of your choice – at your premises, at your provider's or at our premises in a professional hosting centre in Germany. 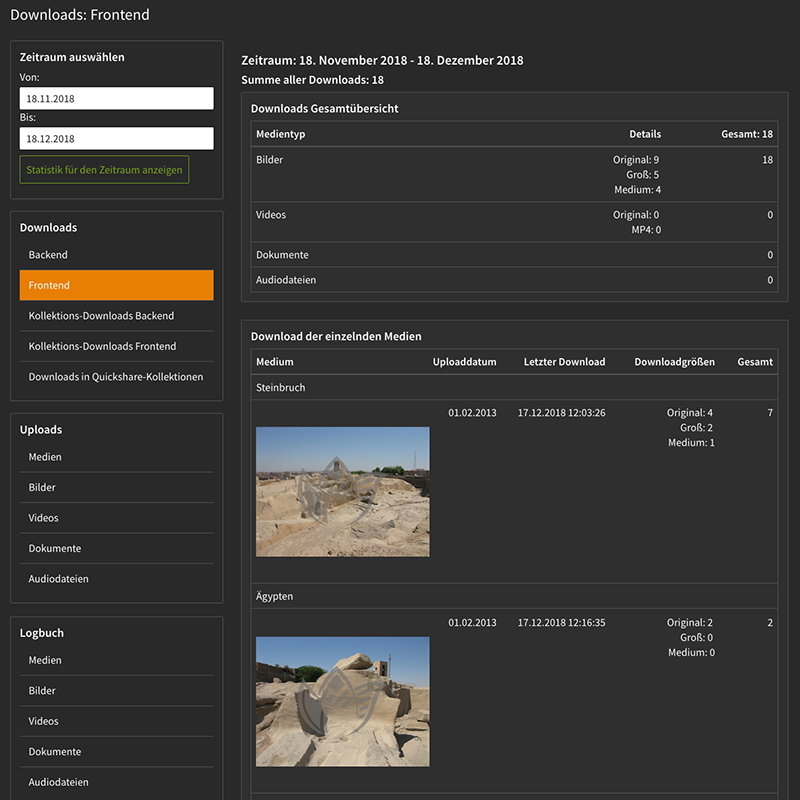 From image to media database: With our modules you can also organize documents as well as audio and video files in your database and thus create a comprehensive media asset management system (MAM). ImagePlant automatically creates thumbnails of all image and video formats mentioned and of PDF documents after the upload. Basically, ImagePlant can be extended so that any file type can be managed in the database. If you are using a special file format that is not listed above, please contact us. 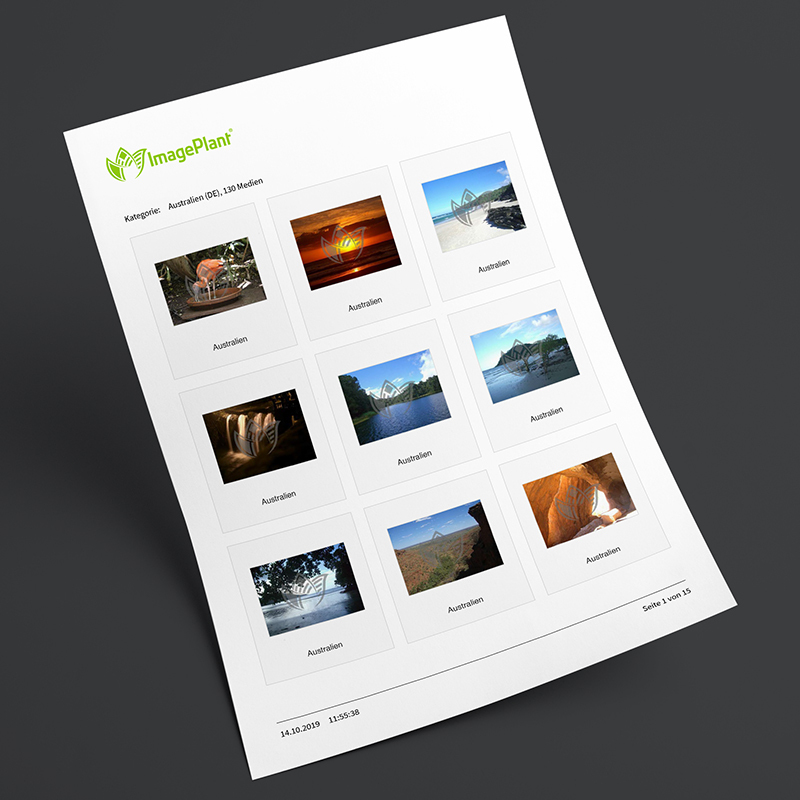 By default, ImagePlant has a frontend that you can use to distribute your media. Whether you use it as a public press portal or password-protected download area (or both) – you have full control over who can see and download which media, categories and collections. With the help of your logo and a suitable colour scheme, you can address your internal and external target groups in your branding – even mobile: the frontend is responsive, so that your media database can also be used on tablets and smartphones. Welcome texts and static pages such as the imprint can be conveniently created and maintained via the integrated Content Management System (CMS). You can also deactivate the frontend completely – temporarily for maintenance or permanently. With the rights management you can control the usage of your media database: From almighty administrators up to trainees, who may only revise the tagging, everything is possible. 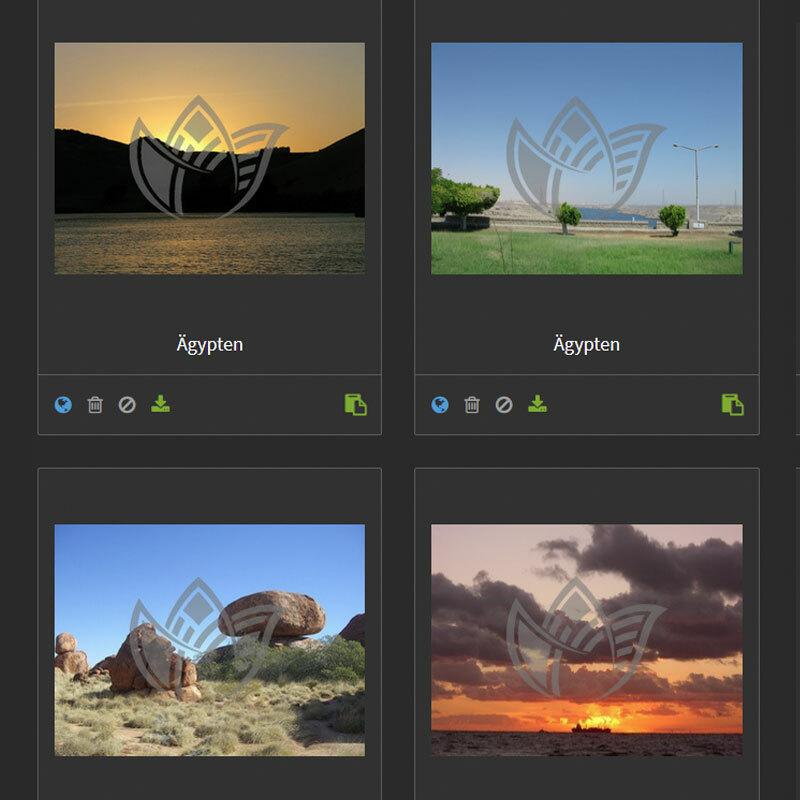 An example: Create an account for external photographers who load their images into a separate part of the image database, from where the image editor sorts them into the final categories and makes them available for download in the frontend if necessary. You can use roles to save rights settings as templates and use them conveniently when creating a new user. We are happy to support you in setting up your own image management and developing the role concept. Please contact us. Categories allow you to create your own structures in ImagePlant. There are no limits: you can create as many main categories and subcategories as you like and thus exactly map the desired systematics. Each category can contain as many media of any kind as you like – and each medium can be linked to as many categories as you like (but is still only once in the media database). The order in which the media are displayed in a category and which one acts as a preview image for the category can also be determined with just a few clicks. 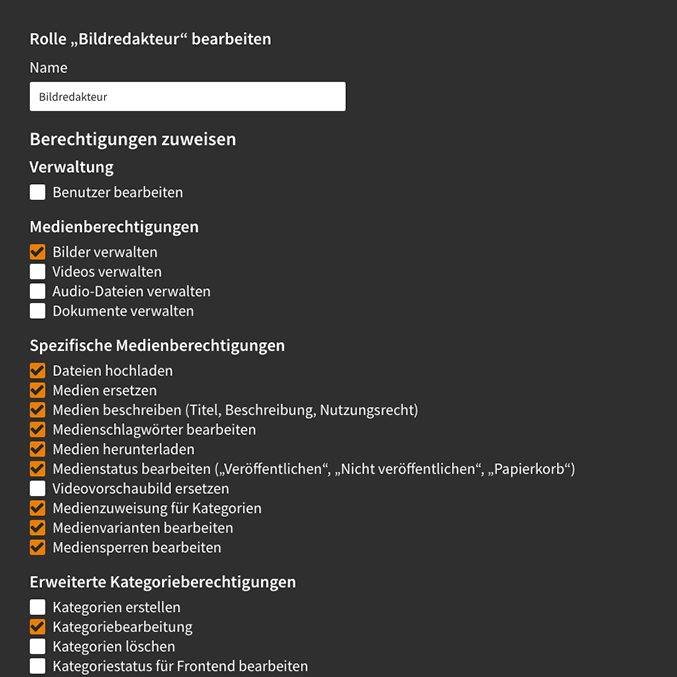 The rights management allows you to determine which users can access which categories in your media database in frontend and backend. We will be happy to advise you on how to set up your category tree. What would an image database be without tags? 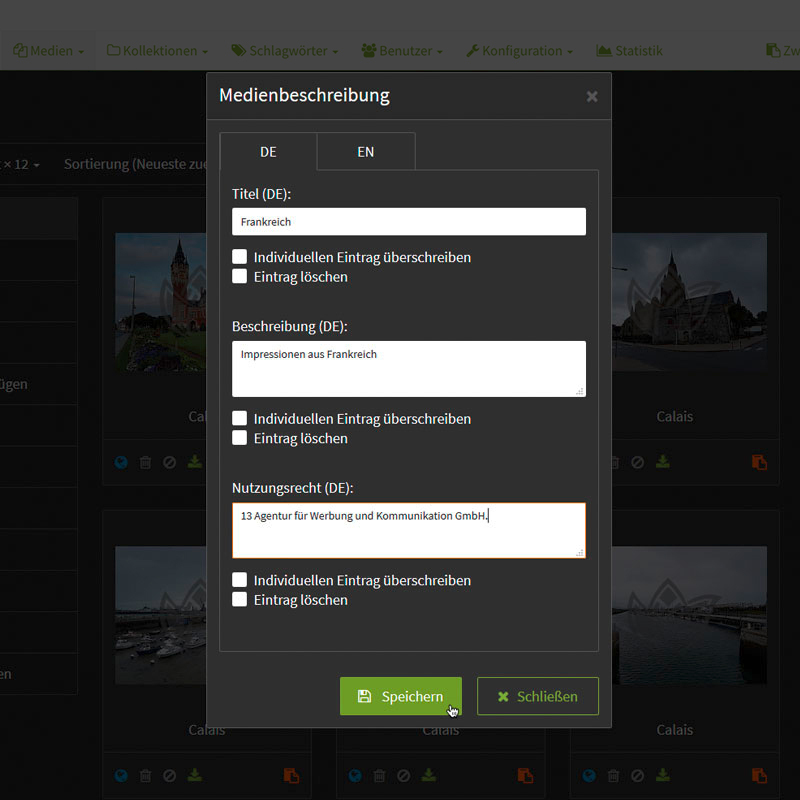 To enable you to describe your media inventory efficiently, ImagePlant supports you in assigning tags: from the third letter onwards, existing tags are automatically suggested. 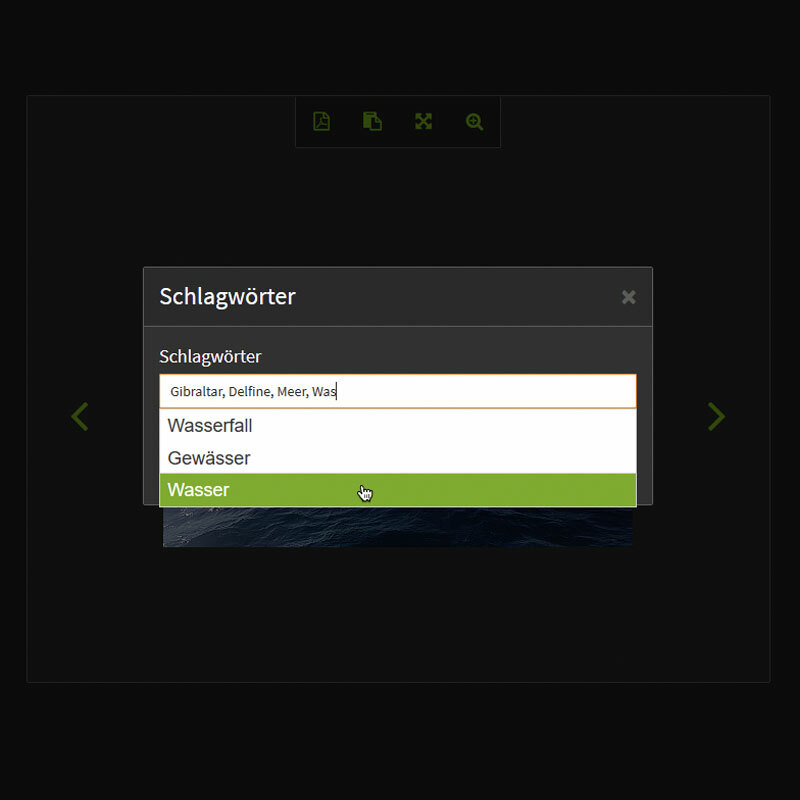 In the convenient tag overview, you can use the real-time filter to find every keyword you are looking for in seconds – and rename it centrally (if, for example, Meier is now called Müller), merge it with other keywords, delete it or display all linked media. If you have special tagging requirements and would like to use defined lists, for example, we can adapt your ImagePlant installation accordingly. Talk to us. If you want or are only allowed to use media for a limited period of time, you can provide them with an expiration date. If this date is reached, ImagePlant automatically locks the file so that it is no longer visible in the frontend and can no longer be downloaded. In the backend of the media database software, the editing of these media is blocked and only users with the appropriate authorization can further process the file. Of course, you can also immediately lock a medium with a single mouse click and release locked media again. If you want to manage media efficiently, you need the tool for it. In ImagePlant this is the clipboard. It works like the shopping cart in an online shop – but it can do so much more: With just a few clicks you can change the information and tags for all media in the clipboard, assign new categories and collections or create a PDF printout. The upload also offers you the possibility to label media on a massive scale. All media uploaded in a single operation share the information entered. 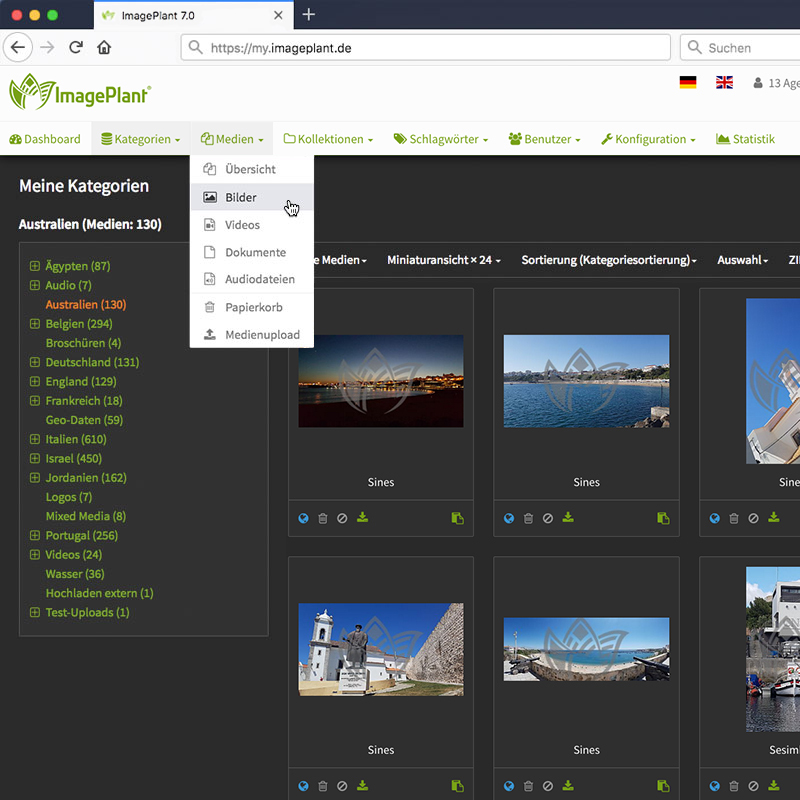 Only the ImagePlant plug-in "Import/Export of IPTC data" is even more efficient: If corresponding information is stored in the image, it is automatically read out during upload and transferred to the image database. When downloading, the plugin writes the current data such as keywords, usage rights, etc. back to the image so that your media always have the relevant information directly at the file. With search operators, you can also perform AND, OR, and WITHOUT searches. You can easily edit the search results individually or via the clipboard as a whole and, for example, save and send them as a new collection. 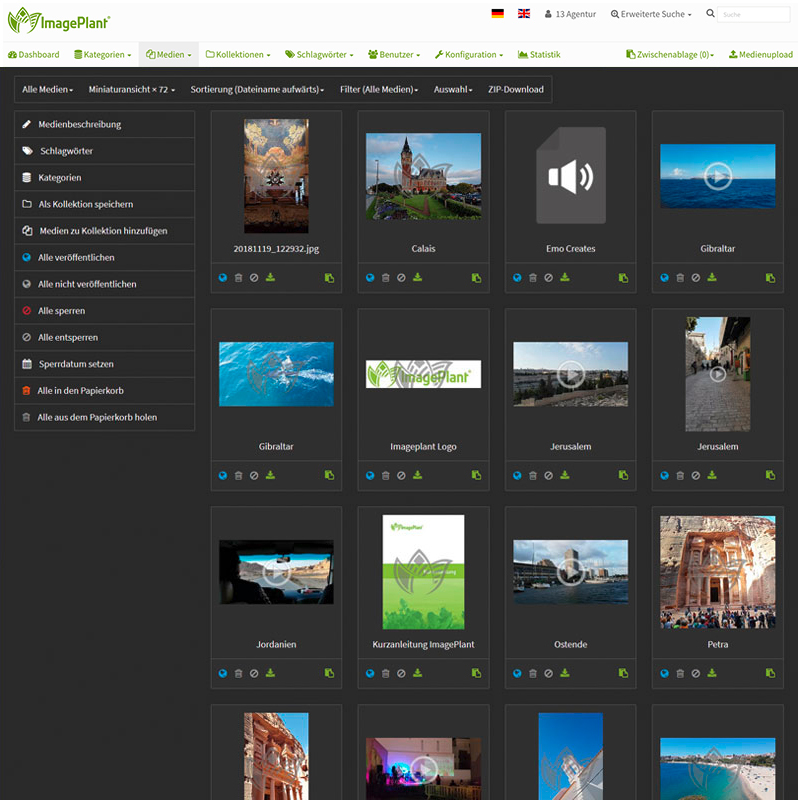 If you want to create media for a specific purpose, collections are the choice in ImagePlant. Whether you're planning a brochure, sharing the best pictures from the summer event, or sharing a selection of media with your clients, simply create a collection and share it with the desired users in backend and frontend. With the Quickshare function, you can send media directly from your own image database – without e-mail attachments and without third-party providers such as Dropbox or WeTransfer. Simply generate a link within a collection, which you can then distribute. 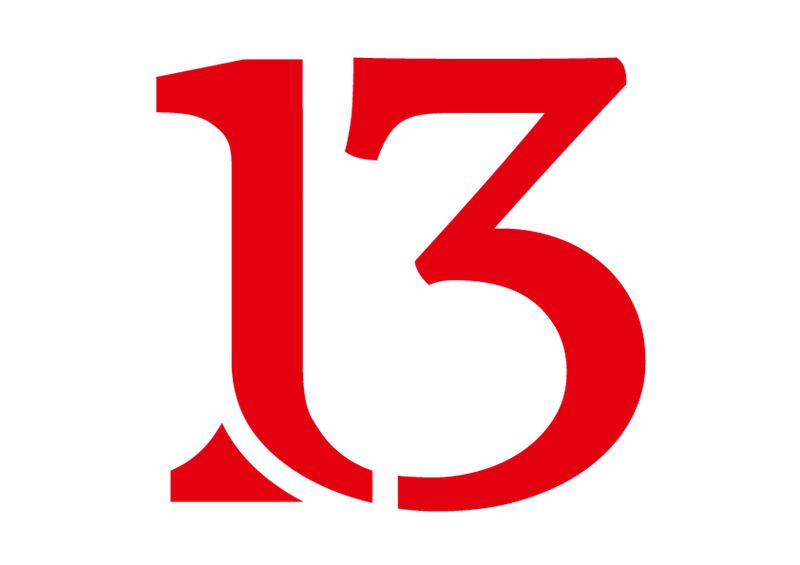 Only those who have this link can access the media shared in the Quickshare collection – for a certain period of time. The link has an expiration date, which can be freely set. You can also specify whether and in which quality level the contained media may be downloaded. 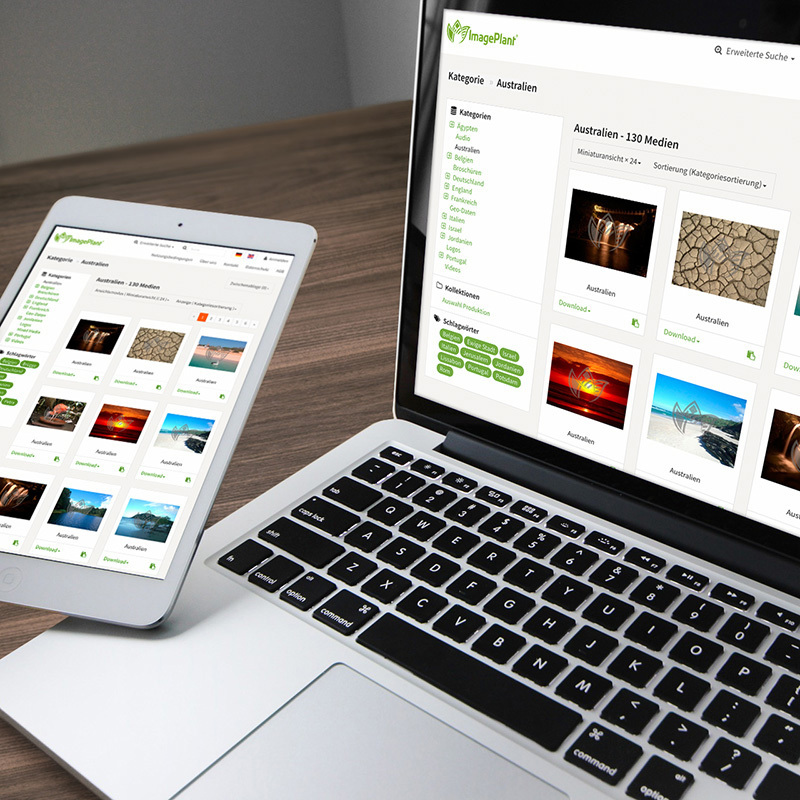 Time-consuming uploads to WeTransfer, overloaded e-mail attachments – with ImagePlant all this is a thing of the past. Plus: your data only leaves your server when the recipient downloads it. Create PDF printouts of many or individual media at one click. 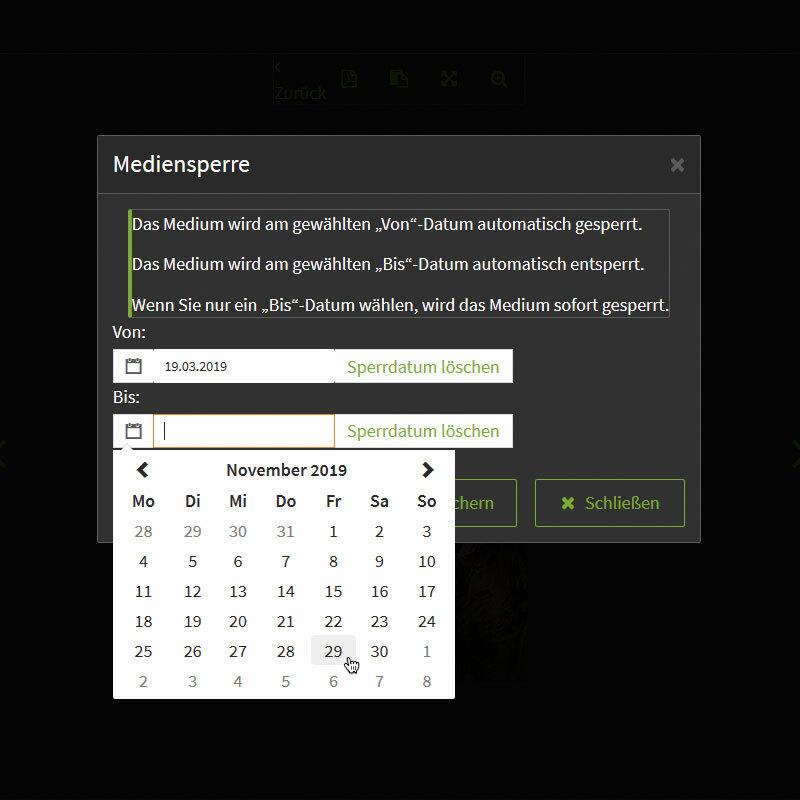 The layout corresponds to the selected view: preview image grid or list view with additional media information. With your logo on it, you can send the contact sheet by e-mail to your business partners or print it out and take it with you to a meeting. ImagePlant has a statistics module that records the use of the image database. This enables administrators to make strategic decisions based on concrete figures or to track potential misuse. If you use the frontend as a download portal, you will also receive key figures on which media are particularly in demand and which users have downloaded. In ImagePlant you can define your own watermark – and clearly mark each image preview as your property. Download versions are delivered as standard without watermarks. If you wish watermarks here as well, we will be happy to set them up for you.